Joseph Jarman, who died on Wednesday, January 9, at 81, was an icon of free jazz and best known for his long association with the Art Ensemble of Chicago. 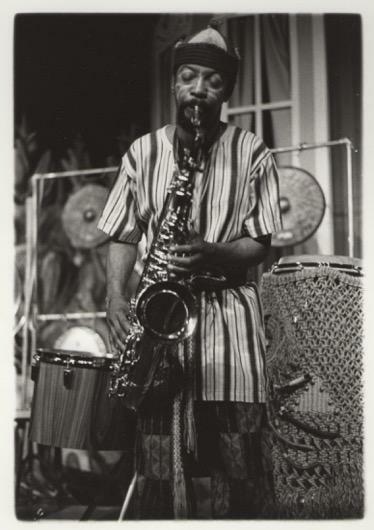 Born in Pine Bluff, Arkansas, and raised in Chicago, Jarman played woodwinds (saxophones, flutes, and clarinet) and was a founding member of both the Association for the Advancement of Creative Musicians and the AEC. Jarman was also a Shinshu Buddhist priest and aikido instructor, pursuits that the The New York Times said "made him less active with music" over the past two decades. (Click here for the Times obit by Nate Chinen.) As a poet, he utilized the spoken word in concerts and on record, beginning with his 1966 debut album, Song for, where he recited "Non-Cognitive Aspects of the City." The album was released on Delmark Records and was part of a series that alerted the jazz world to the profusion of experimental music then being played in Chicago by Jarman and his colleagues Roscoe Mitchell, Anthony Braxton, and the late Muhal Richard Abrams. The Art Ensemble of Chicago was the most enduring group to emerge from the AACM. I saw them in concert several times over three decades and was continually dazzled by the quintet's epical, ancient-to-future musings. Combining music, dance, poetry, lighting, costuming, face paint and farce, as well as a stunning array of instruments, an AEC concert was my idea of performance art, though rarely was it hailed as such by the art/crit establishment. Equally transporting were two back-to-back performances of Egwu-Anwu (Sun Song) that I saw Jarman play with AEC percussionist Famadou Don Moye. Sun Song was voted #1 Album of 1978 by the staff of WCUW, the community radio station in Worcester where I began my career. The station also presented a creative music series on Monday nights at the New England Repertory Theater. On November 18, 1978, I joined a multi-vehicle caravan that drove to New York to see Jarman and Moye play Sun Song at the Public Theater and to transport them and Moye's formidable array of percussion instruments back to Worcester the following day. On the four-hour drive from New York that Sunday afternoon, my colleague Alan West and I talked with our new aquaintances mostly about sports, and Jarman expressed surprise that our destination, which he knew of through Holy Cross College basketball, wasn't spelled "Wooster." Once in town, we made a memorable pass by one of the city's black nightclubs, the Hottentot Lounge, and after a bite to eat, took in the movie Ashanti. Michael Caine, whose Ashanti co-stars included Richard Burton, Omar Sharif, and Rex Harrison, called it the "third worst" movie of his career. When I expressed puzzlement over the choice of this soldier of fortune saga, Jarman, who was an Army veteran, said, "Why not? We're Black Music mercenaries!" Alas, the movie was a drag, but the following night's concert was spectacular. Most everything I heard Jarman play was original to himself or his colleagues in the AEC, but here in memorium I'm especially drawn to his 1996 performance with pianist Marilyn Crispell of John Coltrane's "Dear Lord." 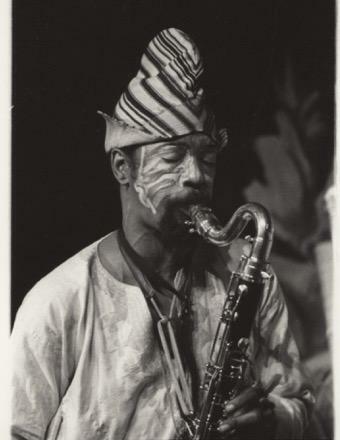 Joseph Jarman, 1937-2019, R.I.P.